One of my most favorite baked treats is the one I tend to make least often. That might be a good thing for my waistline, but I’ve decided that is just plain unacceptable. 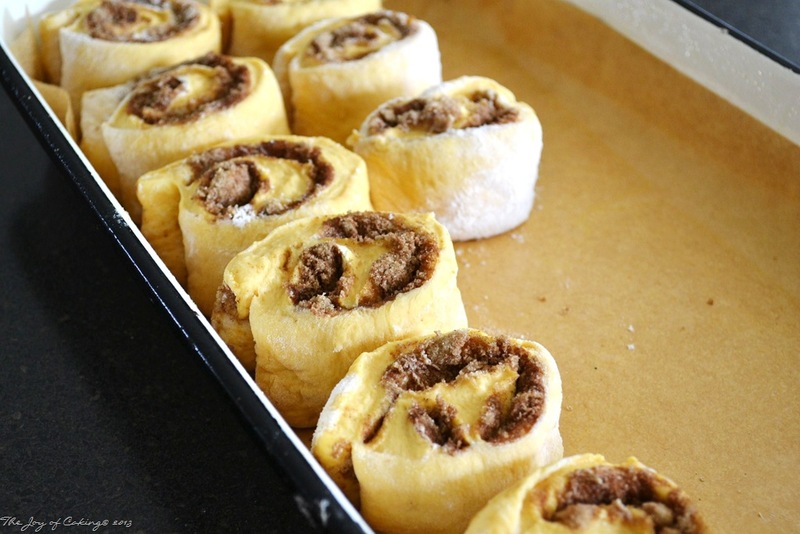 These rolls have a soft and chewy texture, and their yellow color is a result of using my secret ingredient – pumpkin. 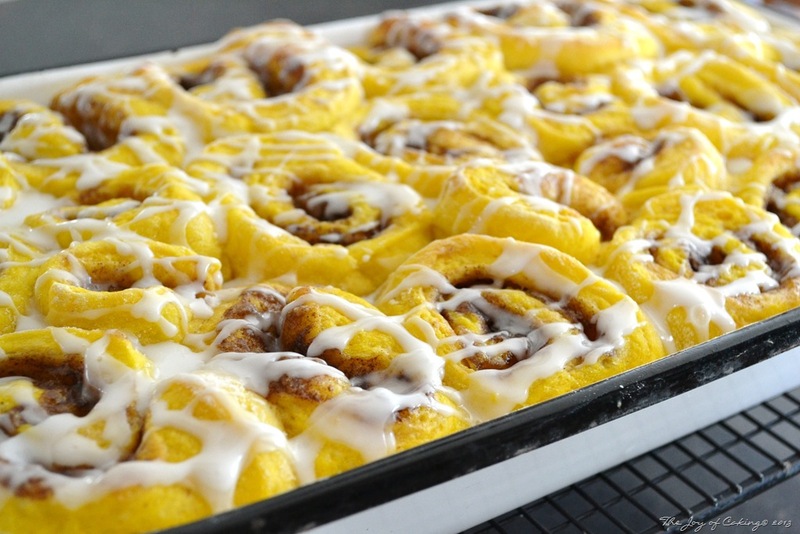 And while I’m talking about the color yellow, some of you have noticed that many of my baked goods tend to be more yellow than other similar recipes. That’s because I use our very own farm fresh eggs that our busy little chickens lay for us each day. The yolks in fresh eggs are so much darker and richer than the eggs you purchase in a grocery store. And why? I’m not certain, but I did read somewhere that grocery store eggs are at least 45 days old before they are available for purchase. I suppose that might have something to do with it. Makes about 1 1/2 dozen rolls. Put margarine, sugar, milk and salt into a saucepan; heat until margarine melts. 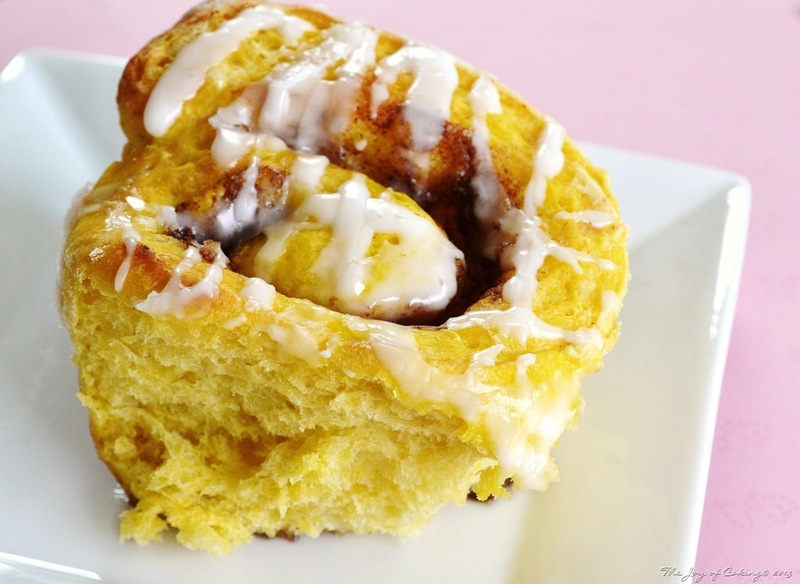 In large bowl, add yeast, 2 cups of flour, egg, pumpkin, and hot water; mix completely. Add remaining flour and mix thoroughly. *Note – the dough will be sticky but you want it that way. On a floured surface, using some of the flour you’ve set aside for kneading, knead the dough until it is no soft, tender, and just slightly sticky. Form into a ball and place in a greased bowl. Cover with greased plastic wrap and let rise until double. Grease a 9”x13” pan. Line the bottom of the pan with a piece of parchment paper and lightly grease the top of the paper. Once dough has doubled, punch down and cut in half. With a rolling pin, roll each half in equal sized rectangular shapes (about 1/2“ thick). 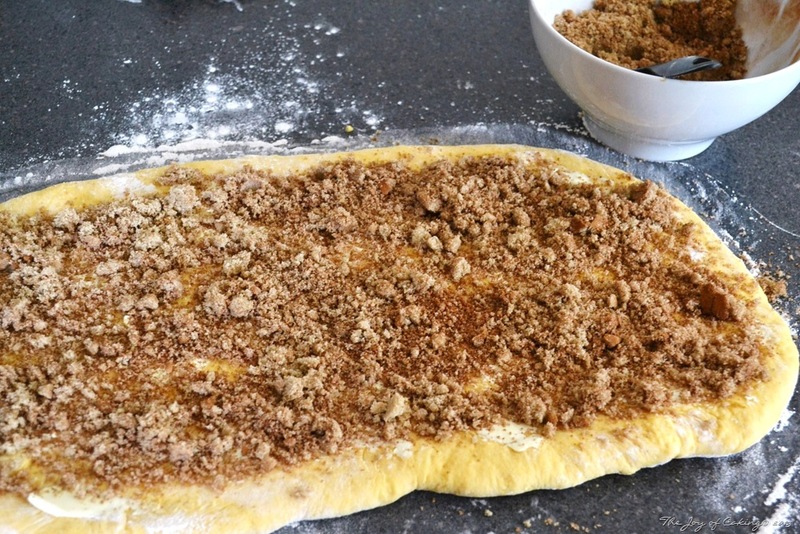 Spread softened margarine on top of the dough, and sprinkle prepared brown sugar filling equally on each piece. Starting with the longest side of the rectangle, roll each piece into a log. With a sharp knife, cut the dough into (about 1 1/2”) slices and place into prepared pan – just so they aren’t touching. Cover with greased plastic wrap and let rise until doubled. Bake in 350 degree oven for about 20 minutes, or until rolls sound hollow when tapped. Let cool, and prepare icing. In a bowl, thoroughly mix sugar, vanilla and milk. Drizzle over top of warm sweet rolls. One thing that’s worth mentioning – when I make sweet rolls I usually cut the very ends off of the logs so that each piece will be equal in size. Most of the time I will fit the odd pieces into the pan between the perfectly shaped rolls. If you are serving the pan of rolls to company and you want them to look perfect then toss the ends out. I just hate to waste deliciousness! I divided this pan of rolls up and put most of them in the freezer. When I need them (yes, need) I’ll thaw a package and breakfast is served. Do you freeze baked goods for a rainy day? Or, are you saying what rainy day? With a few lemons rolling around in bottom of the refrigerator drawer that needed to be used up, and the urge to bake, I did a quick search on-line for something lemony to make. Thinking along the lines of cookies actually helped narrow my search down. 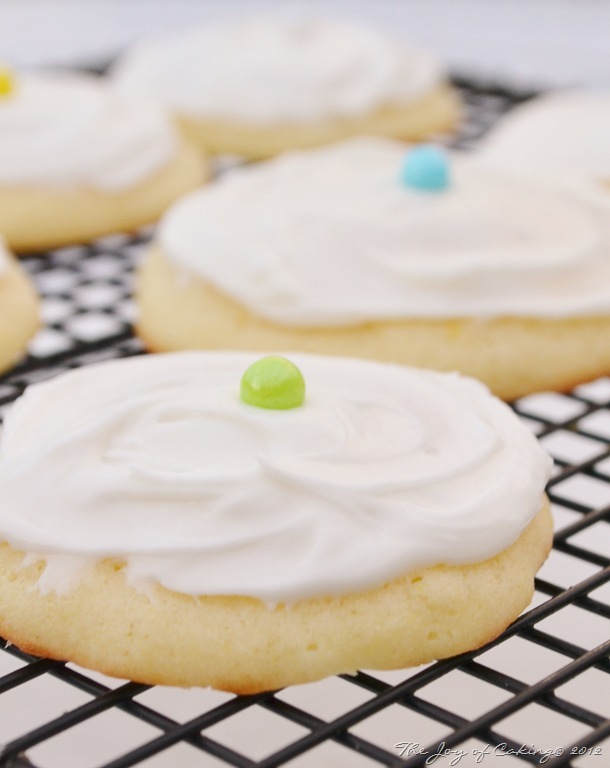 I found a lot of recipes for lemon cookies that called for a lemon cake mix but I didn’t have such great luck finding a lemon cookie recipe made from scratch. I eventually found a delicious looking recipe from Landolakes.com that fit the bill – with a few changes of course. I transformed their cookie, described as “crisp and tender”, into a soft and tender cookie – just the way I like them. I also made a vanilla buttercream frosting for my batch of cookies, whereas they made a lemon glaze for theirs. Line 4 cookie sheets with parchment paper. Preheat oven to 375 degrees. In a large bowl, cream together butter, margarine, eggs, sugar, and lemon juice. Add cream of tartar, baking soda, and salt; mix thoroughly. Add flour one cup at a time mixing well between each addition. Drop by spoonful on prepared cookie sheets about 2 inches apart. Bake for 6 minutes, or until cookie is a light golden color. Remove from oven an allow to cool before transferring to a cooling rack. Frost when completely cool. For a hint of color I topped mine with Pearls. In a large bowl, add softened butter and vanilla; mix thoroughly. Add powdered sugar 1 cup at a time. Add a drop or two of milk to get frosting to your desired consistency while mixing. Beat until smooth and creamy. I’ve had several people ask me about getting your frosting to the right consistency. Here are a few of my tips. 1. Always soften the butter before mixing up a frosting, but don’t melt the butter. Melting is bad! 2. Add powdered sugar 1 cup at a time; beat thoroughly after adding. If the frosting seems to stiff, add a drop of milk to thin it, but be careful not to add too much milk at once. A little milk goes a long ways. 3. Add vanilla extract before adding and mixing final cup of powdered sugar. 4. Beat for 1-2 minutes for best results. 5. If the texture isn’t to your liking carefully add a bit more sugar, or a bit more milk – which ever you need to get to your desired consistency. These cookies will melt in your mouth. You will hear oohs and ahs from the lucky tasters of them! When I was a little girl my grandma would make a pie just about every week for Sunday dinners that I loved being invited to. Grandma’s pies never looked perfect but they were always delicious, and today I admire her for making them so faithfully. My pies, like my grandma’s, never look perfect either. And like hers, they are always very tasty but I surely don’t make them weekly. I guess it would be safe to say that I’m lucky if I make one every few months, or so. I love going into diners where their dessert menu boards are typically filled with a never-ending list of their homemade pies – lemon, cherry, coconut cream, chocolate cream, banana cream, custard, red raspberry, black raspberry, peach, and of course apple. It’s proof that pies are not a dying breed. Perhaps today, people are more inclined to order a slice of their favorite pie out rather than make one at home. What do you think? Since today is Sunday, and I haven’t baked all week, I thought I might as well make some pie and make my grandma proud. This pie crust recipe came from The Good Housekeeping Illustrated Cookbook. Put all the dry ingredients into a large bowl. With a pastry blender, cut the shortening into the flour. Sprinkle one tablespoon of cold water at a time into the mixture; mix lightly. With hands, shape pastry into a ball. Divide dough in half. On lightly floured surface roll each dough into a circle that is about 2 inches larger than the pie plate, and about 1/8 of an inch thick. Place pastry into pie plate and pinch edges. 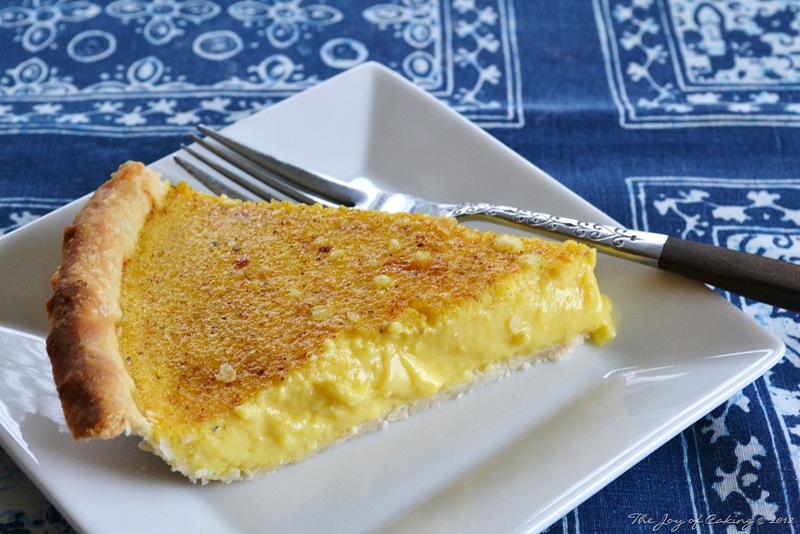 This custard pie filling recipe was adapted from the same cookbook. Preheat oven to 425 degrees. 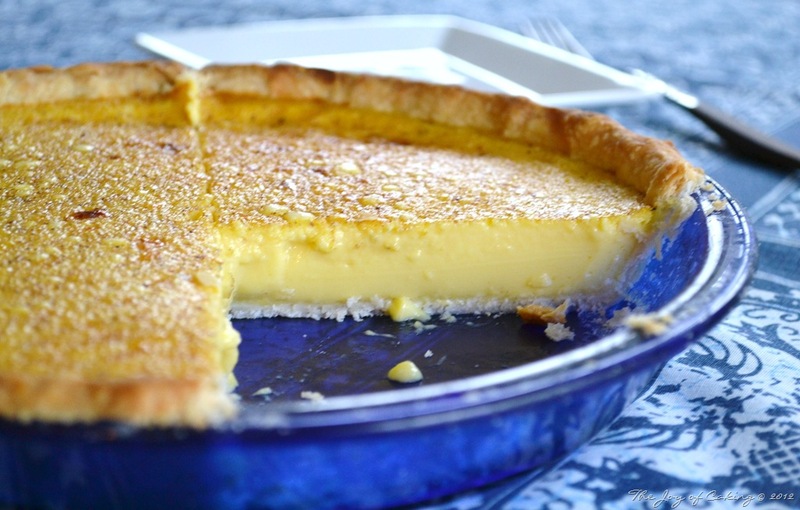 Rub softened butter on unbaked pie crust and put in refrigerator until filling is ready. In a medium bowl, add all ingredients. Whip ingredients with wire whisk until mixed. Pour custard mix into pie shell and carefully transfer to oven. Bake for 25 – 30 minutes, or until a knife comes out clean when inserted about 1 inch from the edge. Cool and refrigerate. Rather it’s a deep dish, top crust, graham cracker crust, or crumb topping I’m all for pie! Do you make your own pie, or do you order it out? Shared this at Weekend Potluck – check out all the other great recipes there! Lemon cakes are sophisticated and elegant. 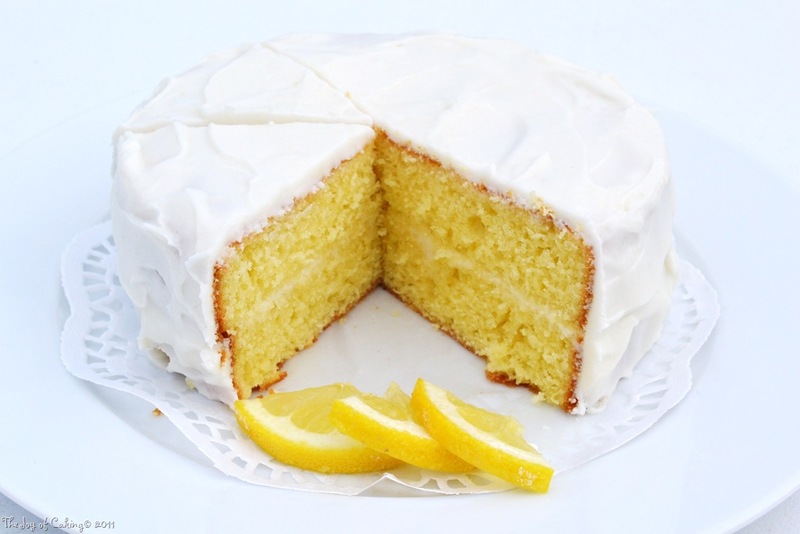 Even with simplistic decorating, a lemon cake has an abundance of charisma. 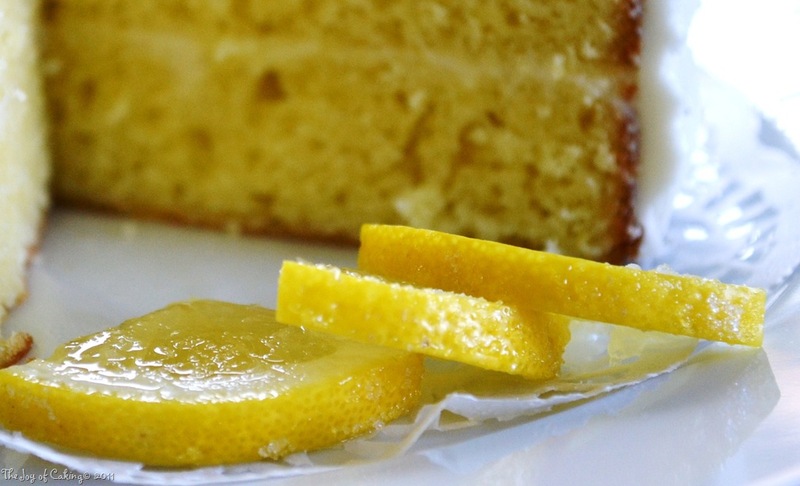 There are occasions when a lemon cake is the perfect choice. They are adored at certain celebrations, and following heavy meals when other cakes are just to rich. 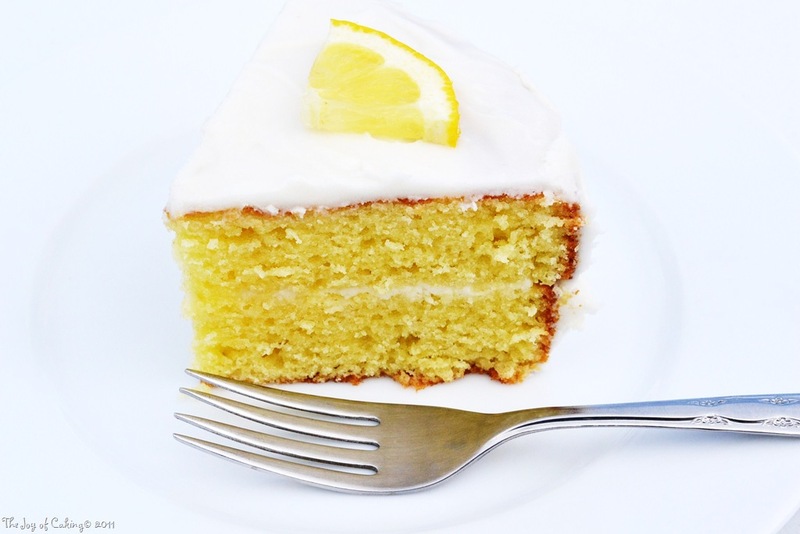 You will never taste artificial flavors in a lemon cake made from scratch (because there aren’t any), and you can always control the level of tartness, or sweetness by adding more or less zest and juice. Preheat oven to 350 degrees. (I made two round 6” layer cakes and 6 cupcakes with this recipe.) Prepare cake pans by spraying with non-stick cooking spray and then lining the bottom of the pans with parchment paper. Spay the top of parchment paper too. Line cupcake tins with papers. In a large bowl, cream margarine, oil, eggs, sour cream and sugar. Beat with electric mixer until creamy and air bubbles form. Add salt, baking soda, baking powder, and flour; mix thoroughly. Add juice and zest and mix well. Pour batter into pans and liners. Bake 6“ cakes for about 20-23 minutes. Bake cupcakes for about 15-17 minutes. (Make sure a toothpick comes out clean when inserted in the center.) Cool and remove from pans, and cool completely before frosting. Top with your favorite icing. I made a butter cream icing with a touch of both vanilla extract and fresh lemon juice for flavoring. Yesterday I decided to make a pound cake from scratch. I followed a recipe in a cookbook I have that claimed the recipe was over 100 years old. The cake called for the typical ingredients with the exception of 1 tsp of vanilla extract, and 1 tsp of lemon extract. It didn’t call for baking soda, just baking powder. I made the cake per the recipe, poured the batter into a loaf pan, and baked it for an hour at the recommended temperature of 325 degrees. I have to say it took a lot longer than an hour to bake completely. In the meantime I ran into the problem of the outside baking too fast. When it came out of the oven I was leery. I let it cool and when it came time to cut it I realized the outside was too brown for my liking. So, I cut the crust off and sliced the cake. It was DELICIOUS! Let me say it again – DELICIOUS. After slicing it I cubed the slices and layered it with fresh-cut strawberries in a glass bowl. When I served it I let everyone put their own whipped cream on top. Unfortunately, I don’t have any pictures because it got eaten so fast there wasn’t time. If I make it again I may try to cover it with aluminum foil to prevent the outside from browning like it did. But this is definitely a make again cake!